NYU Langone Medical Center issued the following announcement on May 9. Led by NYU School of Medicine and published online in Nature Biomedical Engineering, the study shows how a new MRI element design woven into garment-like detectors can capture high-quality images of moving joints for the first time. Since its emergence in the 1970s, MRI has given physicians a better look inside tissues, helping to diagnose millions of maladies per year, from brain tumors to internal bleeding to torn ligaments. Despite this impact, the technology has long struggled with a basic limitation. In a first for MRI, a glove-shaped detector proved capable of capturing images of moving fingers. The technology shows how tissue types move in concert, which could be useful in cataloging differences seen in injury. With no electric current created by the MR signal, the new receiver coils no longer create magnetic fields that interfere with neighboring receivers, thus removing the need for rigid structures. 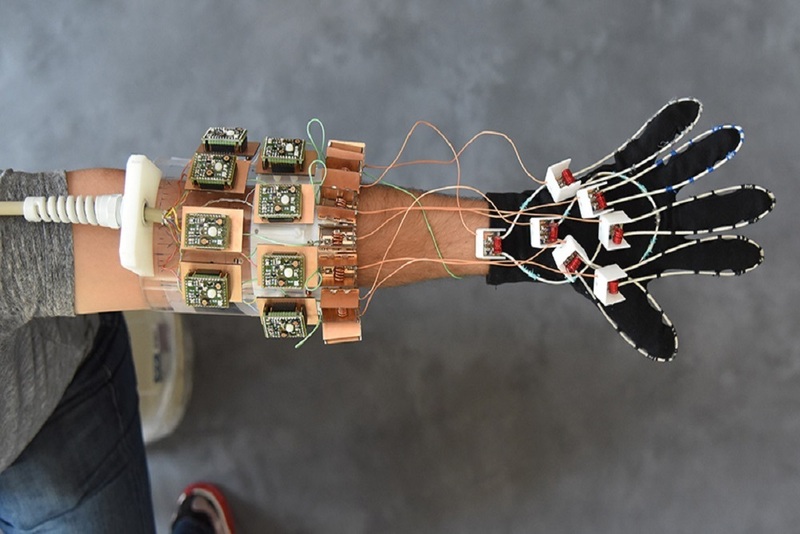 The researchers found that their system, with the new coils stitched into a cotton glove, generated “exquisite” images of freely moving muscles, tendons, and ligaments in a hand as it played piano and grabbed objects. The MRI signal is produced by hydrogen atoms (protons), and so this technology excels at imaging soft tissue structures rich in water, each molecule of which includes two atoms of hydrogen. For this reason, MRI is great at imaging muscles, nerves, and even cartilage, which are difficult to study using other noninvasive methods. Tendons and ligaments, however, which are made of dense proteins instead of fluid, remain difficult to see independently, because both appear as black bands running alongside bone. Also leading the study was Daniel K. Sodickson, MD, PhD, vice chair for research in the Department of Radiology, director of the Bernard and Irene Schwartz Center for Biomedical Imaging, and principal investigator for CAI2R. The Center for Advanced Imaging Innovation and Research is funded by National Biomedical Technology Resource Center grant NIH P41 EB017183 through the National Institute of Biomedical Imaging and Bioengineering. Want to get notified whenever we write about NYU Langone Medical Center ? Next time we write about NYU Langone Medical Center, we'll email you a link to the story. You may edit your settings or unsubscribe at any time.